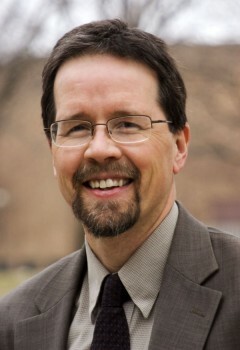 John D. Roth, a professor of history, recently finished writing his book Practices: Mennonite Worship and Witness, the third in a series about Mennonite identity. Photo Contributed. After five years of research and writing, professor of history John D. Roth completed the last of three books about Mennonite identity in the 21st century. The third book, Practices: Mennonite Worship and Witness, was completed this June and focuses on Mennonite ethics as an expression of how Mennonites worship and are witness to their beliefs. The first book of the trilogy, Beliefs: Mennonite Faith and Practice, was published in 2005 and focuses on the theology of Mennonites. The second book, Stories: How Mennonites Came to Be, is primarily historical. “There is a sense in which every generation needs to articulate the Christian faith in contemporary language,” said Roth, noting that previous attempts to do so were written for different generations. The books offer an overview of Mennonite beliefs, acknowledge how other faiths differ in some of those beliefs, and identify questions and issues that are still unresolved within the church. Practice is somewhat different from the previous two books because it focuses more directly on the current state of the Mennonite church. “[Mennonites] don’t have a well-developed theology of worship and are often suspicious of an emphasis on heavy-handed evangelism, which leaves us tongue-tied about these very important aspects of the Christian faith,” Roth said. Although these books are intended for Mennonite congregations (baptism classes or new members), Roth believes the conversational tone of the books makes them inviting to non-Mennonite audiences as well. Copies of all three books can be purchased at the Goshen College Bookstore or at www.amazon.com.